At 60 years old, Billy Moyer is far from retirement. He’s run the full UMP Hell Tour schedule thus far. The schedule features a demanding 28 races in 30 days. Moyer went to victory lane last weekend. He claimed the $10,000 prize at Fairbury Speedway. Heading into LaSalle Speedway, Billy Moyer was 2nd in the point standings. He trailed Shannon Babb by just 65 points after 10 races. 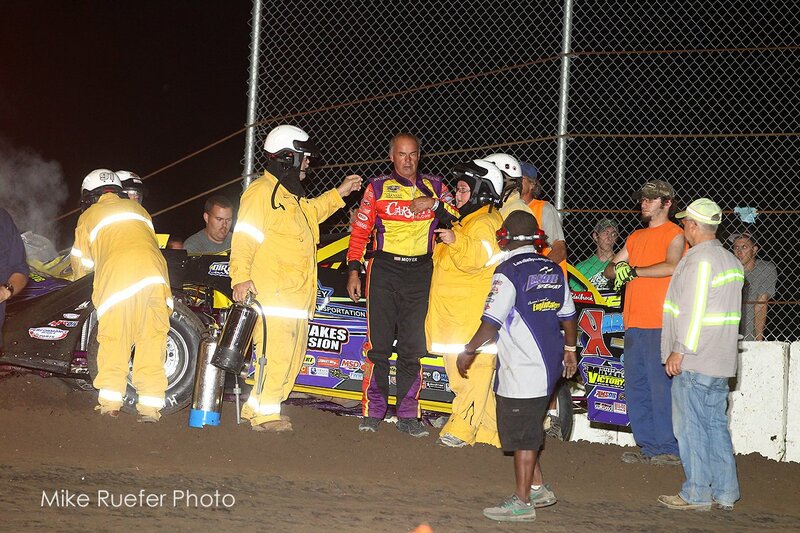 However, Billy Moyer was involved in a crash that hurt his points battle. 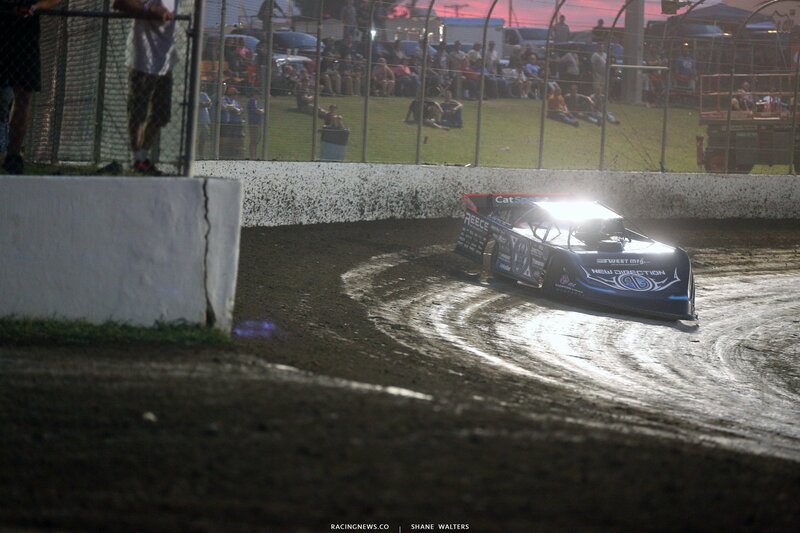 Moyer hit the pit gate opening in turn 3 at LaSalle Speedway. The pit gate opening is directly at the entry to turn 3. A portion of the wall sticks out. If something goes wrong at the entry of the corner, hitting a wall head on is a possibility. That’s exactly what happened to Billy Moyer. The entire right front was removed from the race car. He smashed the wall endpoint head on. There were water barrels placed in front of the wall. Those were crushed as the water flew 30 feet into the sky. Luckily, the driver has checked out ok after climbing from the tore race car. The only injuries appear to be some sore muscles. There’s a lot of theories across all forms of racing about the proper way to handle the pit gate openings. Entry and exit of a race track can create dangerous openings. Due to the incident, it’s created a conversation about race track safety. “Yes sir you’re exactly right, I hope we don’t have to wait for a fatality before a change is made,” Billy Moyer Jr responded to twitter users on the topic of track safety. It’s never a great idea to point out possible issues without providing a solution to the problem. Billy Moyer Jr gave a solution. “You put a gate there like I-55 has on the back stretch or you change the exit to another area where a blunt area cannot be hit Eldora / I55 / Macon / Meridian / Magnolia all have it figured out and safe,” the son of Billy Moyer concluded. “First and foremost we are very thankful that Billy was able to walk away ok and we feel bad that he lost a race car in this accident but that is why it’s called a accident and also a product of good hard three wide racing,” track promoter Tony Izzo Jr told RacingNews.co . “We have made changes to make this safer. It used to be a bigger issue before we moved the backstretch wall to make things wider and safer this is the first incident we have had since we made these changes several years ago but one incident is too many for us. So, as always we will look at every and all options to make things always safer for are competitors and fans,” Tony Izzo concluded. Many pit gates sit on the exit of turn 4 or turn 2. The opening creates a situation where no wall ending sits in the path of race cars. Billy Moyer is not the first or the last driver to hit pit openings at an asphalt or dirt track all across the country. Pictured below is the pit gate opening at Magnolia Motor Speedway in Columbus, Mississippi. Last night, The UMP Hell Tour landed at the Terre Haute Action Track. Billy Moyer was not in attendance at the event.